The gemstones are set with a bezel made of knots held by a wire armature. The ring on the left features a Charoite from Russia. It has a gorgeous lavender color with swirling patterns of interlocking crystals. This stone has chatoyant streaks throughout. The ring on the right has an Eilat, a secondary by-product from the copper mines in Israel near the Red Sea. This green mineral is composed of azurite, malachite, turquoise, and chrysocolla. 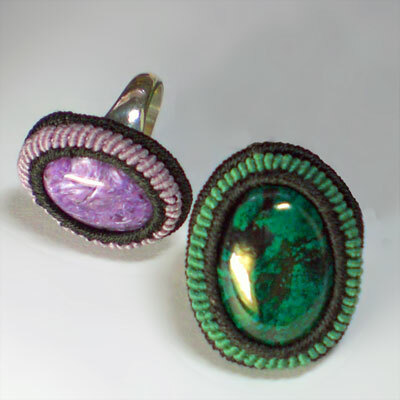 Gemstone cabochon set in a knotted nylon thread bezel with copper armatures. Mounted on a sturdy silver shank.